What happens when CSI leaves the area of a crime scene, well these two chicks come to clean the mess up. As watching this film I wondered to myself “have I seen this film before”. Then I said this is a lot like Little Miss Sunshine. It’s pretty obvious too since both have dysfunctional families, Alan Arkin playing the weird but wise grandfather, the titles are very similar (“Sunshine”), and they both have the same producers working. Though this film has a bit of a different feel to it. At times, I felt the quirky moments in this film were forced and just put in for the sake of this being an indie film, and you know all of them have to have quirky moments. The film does very well in inserting humor into this at times very serious and dramatic story.The central message of this film is how families can provide strength in times of need. I felt like this message was brought up well throughout the film, just not as effectively as Little Miss Sunshine. Amy Adams finally steps away from those side characters and proves in a very strong performance, that she can be the leading woman and still make it a great watch. Very credible is Emily Blunt co-starring in a film as a lost stoner who doesn’t know what to do with her life. She totally abandons her English accent and does a great job with her American accent, and she does a great job as well. Alan Arkin plays that crazy father we all know him as, but he still does a credible job as a father who loves his family despite the hard times. The film shows laughter in hard times, while still maintaining that sense of reality. The film is not afraid to leave some questions unknown which is something now-a-days that is very critical, and I respect this film for taking a chance. 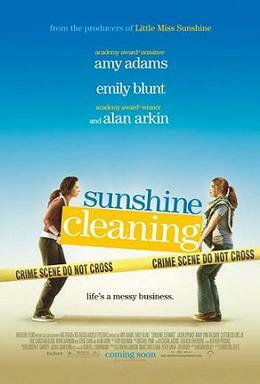 Sunshine Cleaning is a winning combination of heartbreak and quirky humour.